In large bowl, beat cookie mix, flour, butter and egg with electric mixer on low speed just until blended. Shape into ball. Flatten dough to 1/2-inch thickness; wrap in plastic wrap. Refrigerate 3 hours or until very firm. Heat oven to 350°F. Unwrap dough; on well-floured surface, roll dough to 1/4-inch thickness. Cut with floured 3 1/2-inch gingerbread boy cookie cutter. On ungreased baking sheets, place cutouts 2 inches apart. Refrigerate on cookie sheets 10 minutes. Bake 9 to 10 minutes or until edges are lightly golden brown. Remove from baking sheets to cooling racks. Cool completely, about 30 minutes. 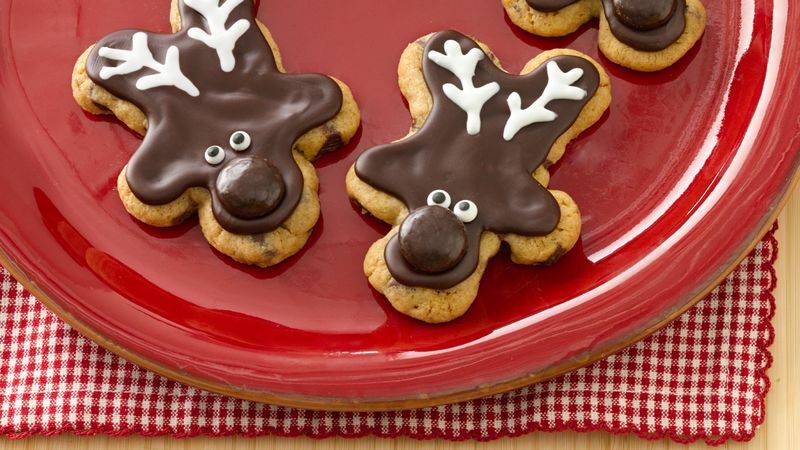 Turn each cookie upside down to look like reindeer face. Outline cookie with chocolate icing; fill in and spread icing with toothpick. Attach candy eyes and mint for nose. Decorate with white icing to look like antlers. Let stand until set.